On the 23rd of July, in the year 1985, The Eurythmics topped the charts with There Must Be An Angel (Playing With My Heart). Cinema-goers were wowed by Police Academy 2: Their First Assignment, and the average house cost £34,700. But for technology enthusiasts, this date is best remembered for the launch of the Commodore Amiga 1000 personal computer, and with it, a new dawn in the computer revolution. The line was discontinued in 1987, but it left an indelible mark on the UK public. It was the first technology that had allowed people to draw on a screen, and was arguably the pioneer of the high-tech creations we all enjoy today on our laptops, iPads and smart phones, and new art technologies like the Sensu digital brush and stylus. Today, there are artists everywhere using technology to create their artwork - David Hockney produces strikingly digital paintings on his iPad, and Wade Guyton is famous for painting on his computer and using inkjet printers to produce his large format prints. Years ago, however, Andy Warhol was once again one step ahead, and famously used the Commodore Amiga for one of his major works. Using the computer’s drawing programme, he produced his famed Debbie Harry portrait, and in doing so was the first digital painter of our time. Now, 27 years on from his early death, a treasure trove of the Warhol's previously unknown work has been unearthed by a group of enthusiasts. The computer club of Carnegie Mellon University has found 23 such digital pieces. The fascinating story of how they were recovered was told in Trapped: Andy Warhol's Amiga Experiments at Carnegie Lecture Hall in Pittsburgh on the 10th May. The documentary tells the story of how the pictures were effectively imprisoned; kept captive on crumbling, out-of-date floppy disks, they stayed in the Andy Warhol Museum vaults for over a quarter of a century. Then computer club members, museum professionals and practicing artists - including Cory Arcangel - began their joint quest to retrieve them. Starting with these newly discovered works, the documentary examines the lifespan of pictures in a world that is now so used to ever-evolving technology. The newly discovered pieces were commissioned by Commodore International so that Warhol could show off the Amiga’s graphic arts capabilities. Among the unearthed gems is a study of a Campbell's soup tin, a three-eyed interpretation of Botticelli's Venus and, of course, a self-portrait of the Pop Art guru. 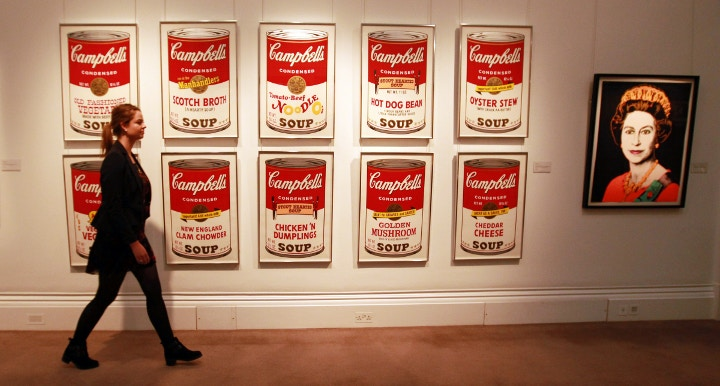 So what do the pictures tell us about Warhol? Warhol's chief archivist, Matt Wrbican, says the pictures show an artist in maturity after half a century of developing hand-eye co-ordination. Then he suddenly had to get to grips with handling the strange new-fangled sensation of using a mouse at the dawn of a new era. Wrbican speculates that the icon might have found this “enormously frustrating”, but the new found images also hint at his incredible versatility and adaptability. Warhol would undoubtedly utilise today's technology to take his work to even greater heights - using pen-based tablets and styluses with full HD resolution, perhaps? The newly unearthed works only go to prove, once again, that Andy Warhol was an artist lightyears ahead of his time. Embrace technology and experiment on your screen with the Sensu Digital Brush and Stylus, achieving effects you never thought possible using the tablet as your canvas. Print your new creations on digital paper including the Permajet Digital Matt Photo Paper or St Cuthberts Mill Enhanced Fine Art Inkjet Paper. Or, if you prefer the physical, hands-on processes that Andy Warhol loved and used time and again, turn to our brillaint Screen Printing products. Don't forget to follow Cass Art on Facebook and Twitter, and tell us what you think about Andy Warhol and digital painting.